One of the most convenient of places to hire a car when visiting Thailand is at the airport itself, and when needing a Phuket car rental upon airport arrival, there is no better place then CarHirePhuket.com. Coming soon – we’ll be launching a new site offering Guaranteed Lowest Pricing for Phuket car rentals. 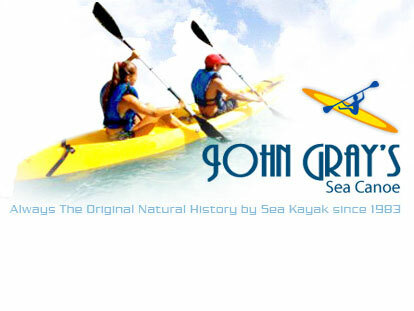 Visit CarRentalPhuket.com to sign-up for a special introductory 5% discount hire coupon. You can easily pick up a new hire car of your choosing on the first floor of the airport, just outside the Domestic Arrivals Lounge and next to the Left Baggage area. CareHirePhuket.com can quickly fit you with a vehicle of your choosing, allowing you to drive out right away and then explore Thailand’s largest and most popular island paradise. In addition, CarHirePhuket.com offers the lowest rates around, and has the widest selection of rental cars on the island, fueled and waiting for your immediate island driving excursion. Start your search by entering your hire dates, view real-time Phuket Airport car rental deals from the top 5 car rental companies operating in Thailand, and then book cheap car hire in the hire vehicle class that suits you best. It couldn’t be simpler, more secure, or convenient, and it saves you time and money! Phuket International Airport (HKT) is located on the north end of Thailand’s top tourist destination, Phuket, which offers vacationers some of the most beautiful beach resorts in the world, as well as first-class business accommodations and convention centers for those that want to mix fun and sun with their work. This gateway to paradise is an ultra modern airport, featuring all you would expect from an international hub that services over 20 airlines and about 6 million passengers each year. View pictures of Phuket Airport over on PhuketPictures.com. Inside the airport you’ll find separate domestic and international departure lounges, and there are numerous food outlets including BurgerKing, Duncan Dounuts and many Thai food outlets. The main check-in area has ATMs from all major Thai banks, and there is an Internet Cafe on the first floor. 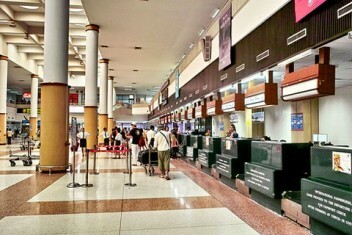 Car Rental desks and Tour Operators can be found on the ground floor outside the arrivals lounge. Taxis and limousine services are also available from the ground floor, although the prices paid are amongst the highest in Asia. If you require a taxi walk outside the terminal building and look for the Co-Op Taxi desk where you can find lower fairs than offered by the many touts inside the terminal building. Meter Taxis are available to the right of the terminal building as you exit, but be sure the meter is turned on when you get in. Navigating away from the airport in your new hire could not be easier, as once you exit, just take the 402 (Thep Krasattri) either north or south for most island destinations. 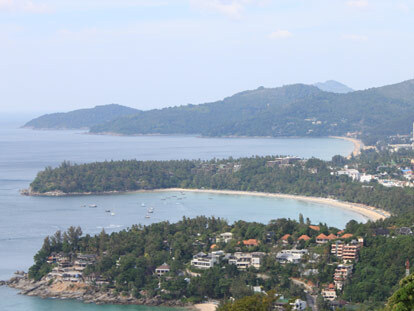 About 8km south on the 402 the highway divides; travelling west on the 4030 takes you to all points on the Andaman Sea (western) side of the island (Kamala, Patong, Karon) while continuing east on the 402 takes you to all points on the gulf side of the island (Phuket Town/City, Rawai, Promthep Cape). With your Phuket car rental from CarHirePhuket.com, travelling the entire circumference of the island is great fun, and can be done easily in just a few hours. Microbubble Spa – Thailand’s first microbubble spa and steam rooms opened this year and they are located at MB House, about 7km east of the Heroines monument, along the road to Pa Khlok, Bang Rong and Ao Po. Microbubble spas are used extensively in Japan to deep clean and whiten skin, reduce stress, and reportedly help one loose that extra weight. For movie buffs, driving and sailing to famous movie locations on Phuket can be a lot of fun, and is easily done in your Phuket car rental. Take a snap shot at Koh Tapoo; renamed James Bond Island after Man With The Golden Gun was shot in 1974. For Leonardo di Caprio fans, a must see is Phang Nga Rd in Phuket Town and Maya Bay on Phi Phi Lay Island where The Beach was filmed in 2000. And for romantic film lovers, see where Bridget Jones II: The Edge of Reason, starring Hugh Grant, Renée Zellweger, and Colin Firth was filmed by visiting Phang Nga Bay. Nai Yang Beach, just a few minutes north of the airport and within sight of Sirinath National Park, go here to just kick back and relax. Patong Beach, for sun and nighttime fun, this beach area has plenty of both and is probably the most popular beach on the island. Karon Beach, not as crazy as Patong, but with as many amenities, this beach has white sand that squeaks under your feet. 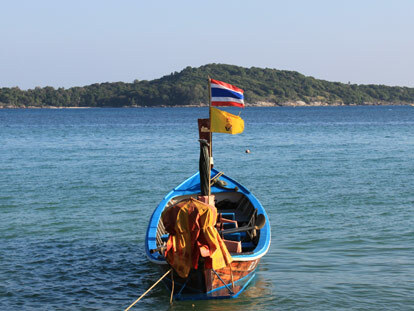 Rawai Beach, a jumping off point for boat trips and cruises to other nearby islands such as Coral, Phi Phi, Similan, Racha, Koh Yao Yai, and Koy Panyee. If you haven’t booked your hotel accommodation you can find the widest range of hotels, excellent prices, and award-winning customer service in multiple languages at HotelTravel.com: Phuket Hotels. 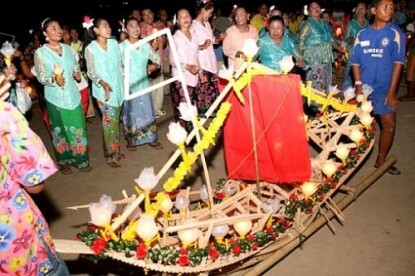 You can also check out HotelRoomsPhuket.com for Phuket villa rentals. For 16 years running, Phuket Bike Week has been a must-do event for any motorcycle enthusiast. The most famous of all bike shows in Southeast Asia, Phuket Bike Week showcases thousands of classic and super bikes – from Harleys to Hondas. Charity events, rides around the island, and live music and parties are all part of this annual week of pure biker fun.